Orchestration in the acoustic world refers to “the art of employing instruments in various combinations” and “includes the concept of instrumentation – the study of the properties and capabilities of individual instruments.” (Randel 575) Composers need to know instrument ranges, playing styles, articulations, extended playing techniques as well as the limitations of particular instruments. In practical terms, orchestration involves taking a basic harmonic structure and melodic line, which could be as simple as a lead sheet or as complex as a detailed piano part with multiple vocal lines, and distributing the essence of the music across an expanded instrumental palette. So a single note melody line in a piano part might be orchestrated for flute, clarinet, oboe and perhaps cello an octave below. The orchestrator begins with what can be thought of as a black and white skeleton and transforms it into a 3D color image through their choice of instrumental combinations. Rhythms in the fundamental structure can also be expanded as appropriate in support of the main melody line. Understanding the linear movement within a progression is essential since most parts will be played by “monophonic” instruments or groups of instruments. For instance, playing a triad using clarinets will require three clarinet players. Doubling in orchestration is one of the most common methods for achieving a desired musical color, timbre and texture. Because each instrument has a specific way that it produces sound (e.g. vibrating reed, bowed string, etc. ), each produces its own unique set of harmonics and spectrum. Each is capable of various articulations and playing styles, which in synth terms, can be likened to the amplitude envelope and modulation settings for a synth patch. 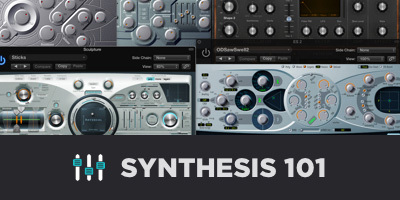 While it is certainly conceivable to design an infinite number of synth patches using a single instrument, the possibilities for rich and sophisticated timbres expand exponentially when you consider the idea of combining different sounds or synth voices. Creasey states “Blending the output of multiple Synthesis sections in parallel (also known as stacking or layering) can produce increased tonal sophistication with modest effort.” (Creasey 544) Blending can result in a thicker, denser and wider sound thanks to the interaction of partials. The evolution of the sound over time becomes a function of the various amplitude envelopes of each sound and the nature of each individual component. While hocketing, which will be discussed below, can be seen as restructuring in a sense, stacking and layering more closely resemble the orchestration process. But whatever you call it, combining synth voices to play the same, similar or connected lines can yield a beautiful synergy, where the resulting sonic amalgam is greater than the sum of its parts. One of the benefits of electronic music in general lies in its immediacy. 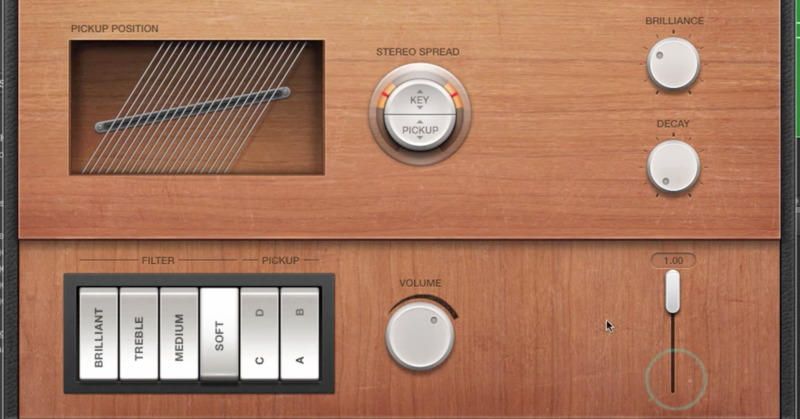 As a composer or orchestrator, you have access to instantaneous aural feedback. This differs greatly from orchestrators working with pencil and paper, a process that involves the imaginative use of known techniques and assumes extensive experience allowing the orchestrator to predict with a high degree of certainty what the music will sound like before it ever reaches the music stand. That said, changes to the initial orchestration are invariably made once the feedback loop is complete at the first rehearsal. 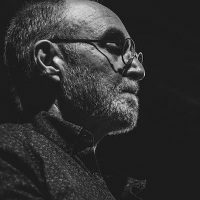 I had the pleasure for working for some of the best orchestrators in Hollywood and Broadway as a music copyist for about 15 years including Jonathan Tunick, Michael Starobin, Harold Wheeler, Don Sebesky and Robert Elhai. In Broadway shows especially, revising charts after or during a rehearsal is common practice. Even the best of the best might rethink a choice after hearing the result live. Of course, the amount of allowable revisions is inexorably tied to budgetary constraints. Even small changes can translate into many man hours for the players involved, music copyists, proofreaders and librarians. 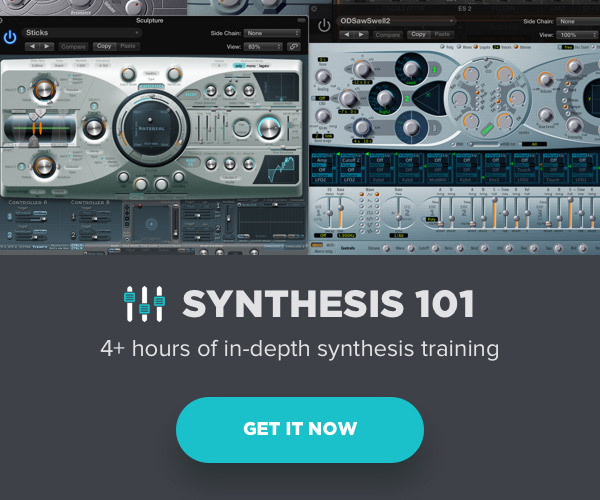 So when dealing with the comparatively simple procedure of combining synth voices, the facility to audition multiple variations in a short period of time should be exploited to the fullest extent. The highly interactive nature of synth orchestration and electronic music, in general, can yield amazing results, not just in terms of finding the right sound for the particular project at hand, but for generating synth stacks and layered sounds for use in future work. The power of serendipity and discovery cannot be overstated. 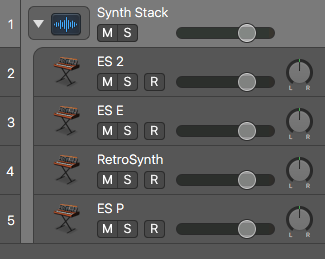 If you come across a sound by happenstance in the building of a stack or layer that sounds particularly awesome, save the patch and name it appropriately. If you don’t, you run the risk of never retrieving that sound ever again. 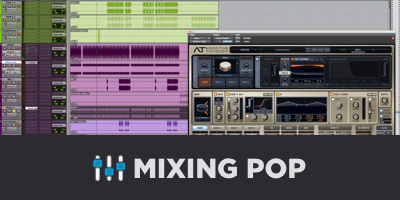 Using a combination of these methods, as well as virtual instrument stacking in a DAW like Logic Pro, for example, are commonly used. 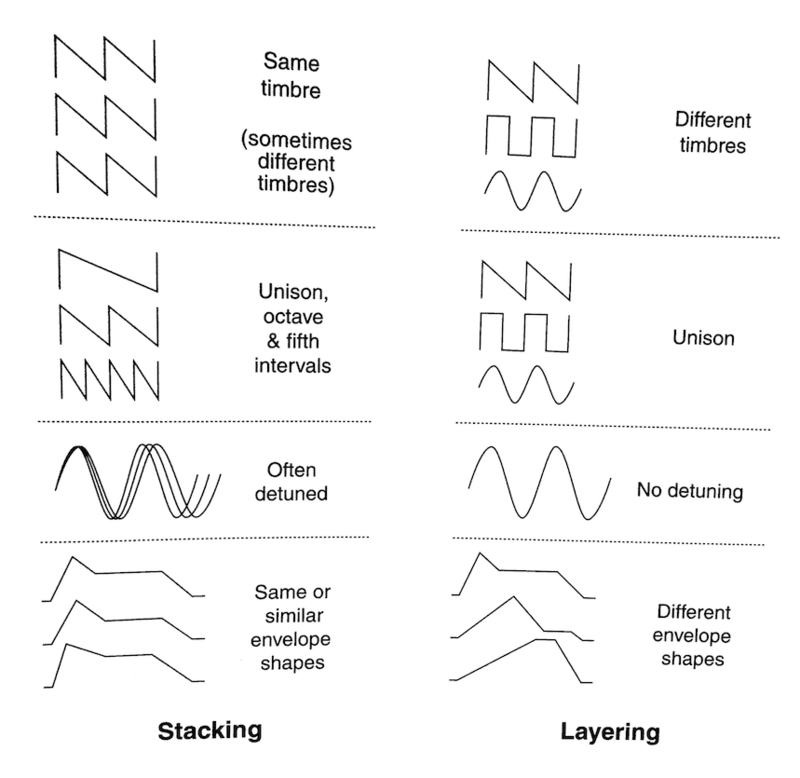 As Russ explains, “Stacks can be divided into two types: composites and doubles.” (Russ 419) The distinction made is that composites involve multiple sounds and doubles use one sound with multiple pitches derived from it. These definitions and particularly that of doubling, do not really align with the acoustic versions of the same idea. When you “double” a melody line it normally involves different instruments playing the line an octave(s) apart or in unison. It could also imply a line that harmonizes the melody in the same rhythm. 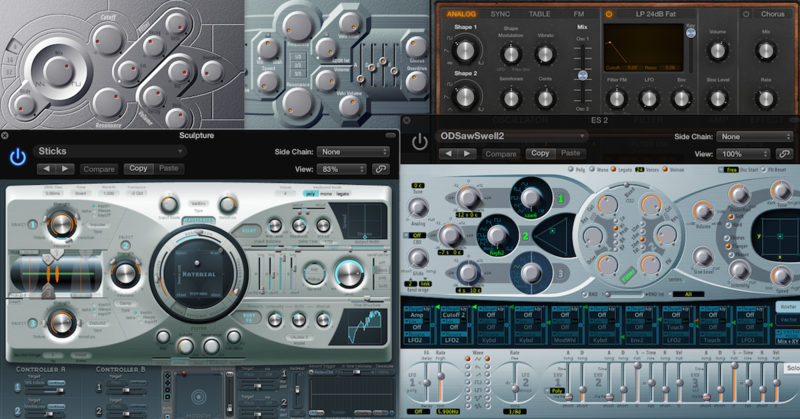 Composite sounds are understood to be composed of multiple sources, either within the same device or produced by several synths that may include a combination of hardware and virtual instruments. In choosing potential sources, one approach is to think in terms of spectrum. Designing a well-balanced sound that uses a wide spectrum can produce powerful and dominating timbres if that is what’s required. Alternately, a more spectrally specific sound might be needed to pierce through an existing texture. There are definitely no hard and fast rules when choosing sounds as each circumstance requires a unique approach. But as with any good mix, it is the context that should be considered first. In the same way EQing a sound while soloed does not provide the necessary sonic environment for judging parametrical choices, likewise, a stack should be auditioned frequently with the mix during the designing process. Detuning can produce a thickening chorus-like effect. Even slight variations of a few cents can often produce significant results. Fixed Interval Doubling involves duplicating the rhythm of a voice at a fixed intervallic distance from the top line (e.g. 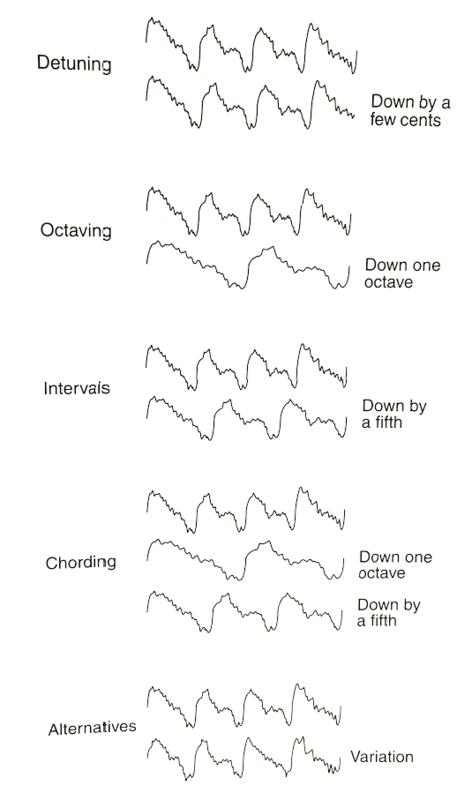 octaves, fifths, thirds, etc.). In layering, the sound is conceived as an amalgam of sounds, each unfolding with a distinct amplitude envelope. 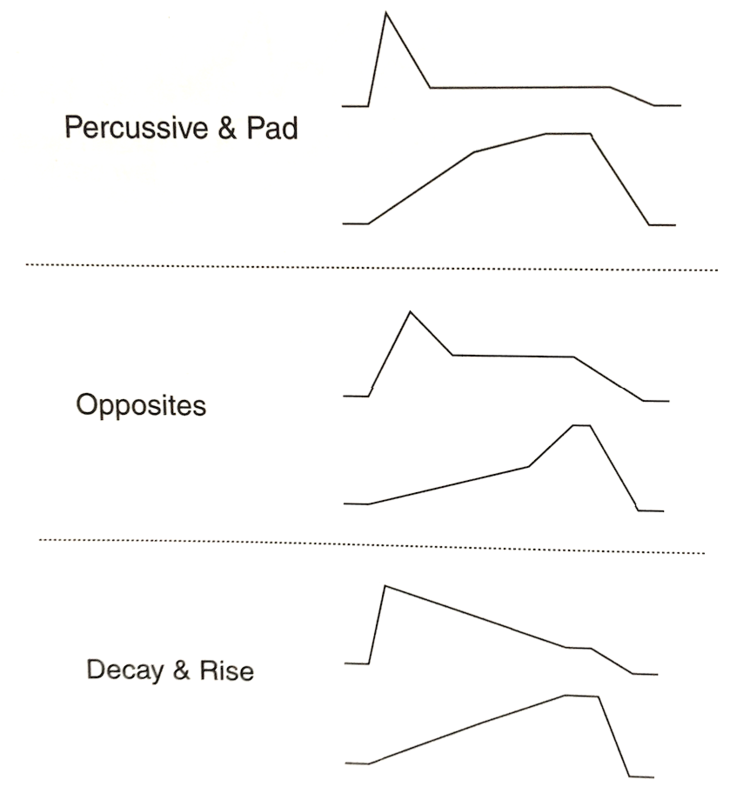 Think of percussive attacks that provide the start of a sustained pad or sounds that have inversely related envelopes. This is an extremely useful approach in terms of sound design, where even relatively short sounds can be composed of several layers of vastly different character. The ear will naturally fuse the sound into a single gesture. Hocketing refers to the technique of having several instruments play parts or fragments or even single pitches of a melodic line so that no single instrument actually plays the whole line by itself. The method dates back to music of the 13th and 14th centuries and was often used with two, three or sometimes four voices. (Randel 378-79). The term Klangfarbenmelodie, coined by Arnold Schoenberg relates to a “succession of tone colors (even if with only a single pitch) treated as a structure analogous to a melody, which is a succession of pitches.” (Randel 430) This idea seems highly related to hocketing and both provide evocative starting points when distributing a melodic line across several synth voices. Russ points out that hocketing can use instruments with contrasting pan positions, effect settings, detuning and timbres. (Russ 425) In practice, hocketing can be a manual process where a line is literally split up and distributed among the available voices, accomplished via a MIDI controller that changes sound source on the fly, or as determined by preprogrammed MIDI instructions. For example, a sampler with multi-velocity layers can be used to create a hocketing effect using randomized velocity settings to trigger several different samples based on preset velocity ranges. The same approach could be applied to automated CC messages, note ranges or beat location. There are countless examples and tutorials online that provide examples of synth layering, stacking and hocketing. You can follow along with someone else’s process if you have the same synths being used and are designing a sound for a similar context. There is certainly something to be learned in reproducing a sound based on a set of instructions in terms of mechanics. But it was my intention with this article to expose the fundamental approaches in the abstract, without specific sounds in mind. Too often I find that students forced to follow a set of defined procedures get all caught up in adhering to the instructions and lose sight of the process itself. I believe conceptualization, visualization and/or auralization are essential first steps when designing a new sound or composing music. Once the actual sound-making begins, the experience itself will generate its own path of discovery, unique to each individual sonic explorer. Creasey, David. Audio Processes. Taylor & Francis Ltd, 2016. Randel, Don Michael. The New Harvard Dictionary of Music. Belknap Press of Harvard University Press, 1986. Russ, Martin. Sound Synthesis and Sampling. Focal Press, 2013.